top tier: Freshly grated parmesan (in a little plastic bag), torn romaine hearts, garlicky croutons, and caesar salad dressing in the pink plastic container. 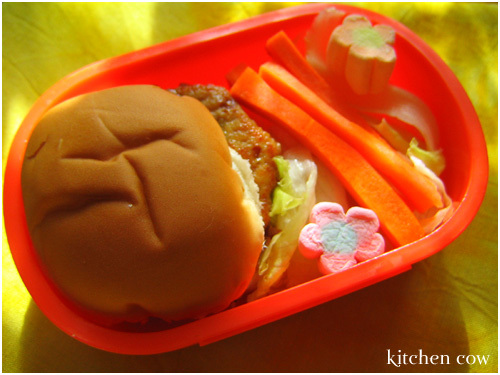 bottom tier: Baby Chicken Teriyaki Burgers (mini chicken teriyaki burger patties and iceberg lettuce in mini-hamburger buns), carrot sticks, and extra teriyaki glaze in the yasai squeeze bottle. dessert mini-bento: Kiwi slices. I know it looks weird. Don’t ask. And here’s a baby bento I prepared for one of my friends. 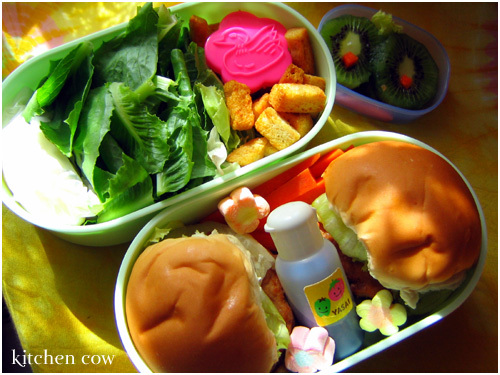 Since it’s a baby burger, I figured it would be cute to put it in a baby bento.